Stopped by 1st Class Auto looking for a Jeep Wrangler, several on lot, looked at all very pleased with each of them, all priced within my means, this made for a difficult decision. I did decide on one of them. Took to my mechanic to check over. He was very surprised how well they preped the car and the overall condition. Needless to say I have had the Jeep now for 2 months and am very happy. I would recommend 1st Class to everyone and have to my friend. The best is here. 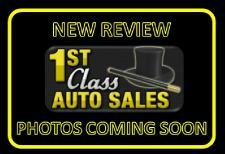 Our neighbor recommended 1st Class Auto and Vince Di Tommasso. We found Vince to be very helpful and pleasant. They were willing to work with us and we went home happy in a minivan. I rate my visit 5 stars. My experience was enjoyable and pleasant. I love the treatment from the staff of 1st Class Auto Sales. They were really welcoming and offered me and my family the best service. I would certainly refer my friends and family. Excellent as always. Tom is 4 for 4. The whole team makes me feel like family. This is my fourth purchase. Wouldn't go anywhere else. I found a used Infinity FX 35 at 1ST Class online and they were thousands below every other dealer. The car is perfect as was my dealings with Marty, would highly recommend.